TEN-PIN BOWLING: Meet the bowlers that are the best in the state according to their coaches. The talented Bundy team last month claimed the South East Queensland Juniors shield for the second time in three years. The Rum City, battling powerhouse regions of Brisbane and Gold Coast, won overall with 20 points to overcome last year's loss to Gold Coast by one and a half points. Bundaberg also claimed first overall in the boys competition with the girls finishing in third. 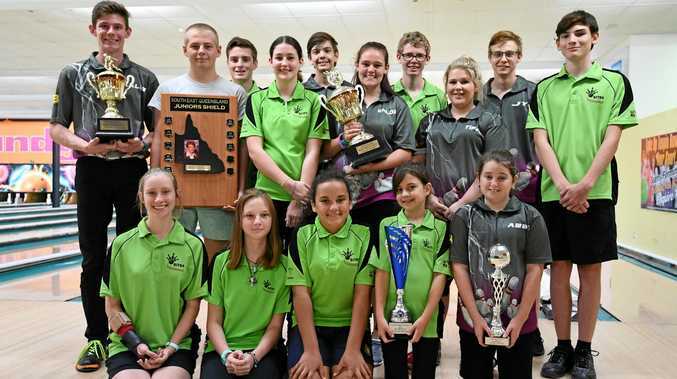 "The last three years the kids have bowled brilliantly,” coach and Bundy Bowling and Leisure assistant manager Barbara James said. James said the success came down to the bowlers and their attitude. "They just want to do the best they can,” she said. In individual performances, Lachlan Lewis-Rickards (223), Pagan Samuels-Rosser (216), Josh Gillard (245) and Amber Craven-Hughes (222) all got scores over 200 in one game. Fellow bowler Kaleb Coyne was another standout, finishing the tournament with the highest average for Bundy of 199 in the more than 15 games he played. He was selected to compete in the All Stars and said the team spirit helped. "The boys team always seem to bond well and work good (sic) together,” he said. "We just continued bowling good (sic), getting our points no matter who was on the lane. There will be more on Coyne and the other bowlers who competed at the shield in tomorrow's NewsMail.